The Legends <招摇> will soon be airing its last episode, but many fans aren’t prepare to watch it. 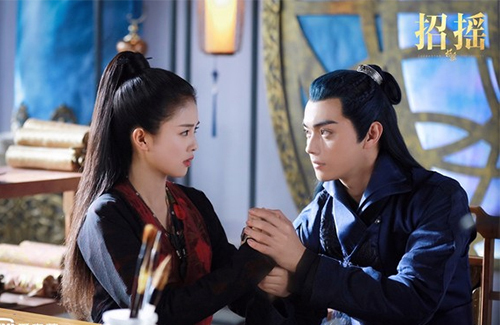 Based on the novel Zhaoyao by Jiu Lu Fei Xiang (九鹭非香), the 56-episode xianxia romance is about a brazen and cold-hearted demon girl who adventures through the mortal realm to avenge her own death. She unwillingly falls in love with Mo Qing, son of the demon king, who breathes life back into her. The Legends, marketed as a light-hearted romance where the bad guys were actually portrayed as the good guys, was a huge hit when it first aired on broadcast. The show also came on air right after Xu Kai (许凯), who plays Mo Qing, hit overnight fame with Story of Yanxi Palace <演習攻略>. It was also introduced to be a different kind of romance—the protagonist is a female lead playing a classic tsundere character who changes for the better after meeting her love interest, the soft-hearted and protective male lead. The original novel also ended on a happy note, and with the author also being The Legends’ main scriptwriter, many fans were expecting the TV adaptation to finish with a similar ending. However, with recent developments happening in the last few episodes of the drama, it appears that the story is leaning more toward a tragic ending—good characters are dying, while enemies are winning. Fans have been getting so upset with characters dying off that Jiu Lu Feng Xiang had to make a statement admitting that she had to change the script to fit certain requirements. She revealed that The Legends was first written as a 40-episode drama, expanded from her original intention of 28 episodes. After adding more filler and story content for the additional 12 episodes, she received a sudden notice that the drama had been expanded to over 50 episodes. In addition to more limitations being set, Jiu Lu Feng Xiang had no choice but to rewrite parts of the story. “Even the creative team was wondering why the romance had to be dragged on for so long,” she said. Many fans are upset to know that the drama would end tragically, as the original intent of the novel was for the characters to have a happy ending. It actually started off poorly IMO; I don’t think it was filmed well at all and didn’t really follow the original plotline faithfully =/. Even if I didn’t anticipate the drama following the novel, I thought a lot of the episodes were filmed awkwardly. In any case, I dropped it after 3 episodes.